China’s doors, windows, building hardware and lock industry gets its wide application in this field after more than 40 years of rapid development. With an open attitude and a win-win determination, China has launched a Belt and Road strategy and has opened up closer cooperation with the world. 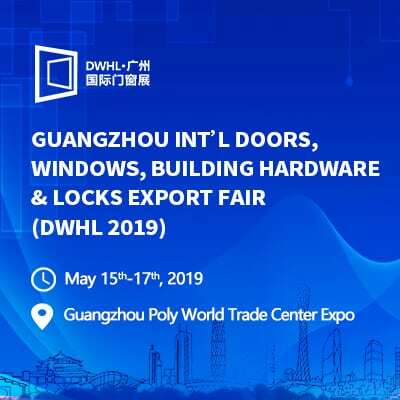 Guangzhou Int’ l Doors, Windows, Building Hardware & Locks Export Fair (DWHL 2019) aims to create a professional display platform for global doors, windows, hardware and locks industry and provide a golden opportunity for product importer, merchants and insiders both at home and abroad. The grand gathering is bound to be a professional international exchange and trade platform in this field. DWHL is expected to host 150+ premium exhibitors on a show floor of 10,000 sq.m. 30,000 professional visitors all over the world will be invited to attend DWHL, including importers, exporters, distributors, agents, brand companies, star hotel, high-level club, building installation company, architectural decoration design institute, architect, engineer and so forth. Overseas buyers will be invited by business organizations in Hong Kong, Japan, Germany, France, USA, Mexico, United Kingdom, Italy, Canada, South Korea, Russia, Australia, India, Belgium and other countries.